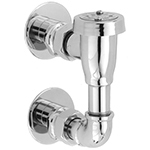 Standard and deluxe arms and flanges, chrome plated. 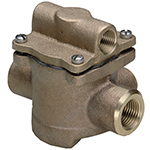 Rugged bronze valves ease valve repair and minimize risk of cross flow. Sweat and threaded versions, straight or angle models available. 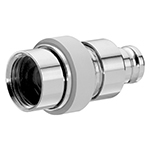 Quick release house coupling. Chrome plated. 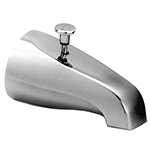 Stainless and chrome plated remodeling escutcheons for use with all Powers bath and shower valves. A complete assortment of commercial grade shower heads including fixed head, adjustable, wall mount, vandal resistant and ABS models. 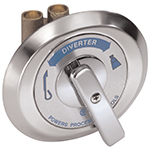 Diverter, non-diverter models in brass and ABS. 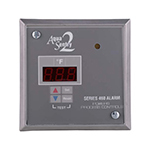 Monitors for high or low temperature conditions. The system utilizes an accurate solid state temperature sensor and microprocessor based digital circuitry to sense and report abnormal temperature conditions. 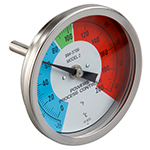 Standard sensing range is –40°F to 199°F or –40°C to 93°C (switchable). The alarm panel can be mounted remotely and provides both audible and visual indication of alarm condition. 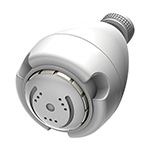 With the addition of a solenoid, the alarm can function as an emergency shutdown system. A unique latching circuit is used so that the alarm holds despite a return to normal condition. This feature indicates that a dangerous condition did exist. The alarm can be silenced at any time by pressing the reset key. After the temperature returns to normal, the system can be reset by pressing the reset key twice. The system cannot be reset while the temperature is outside the setpoints. The alarm module can be panel mounted, or installed in a standard 4 x 4 electrical wall box (supplied). 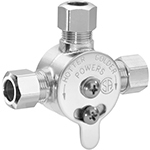 Powers Series 440 water mixing valves consist of a thermostatic mixing valve, separate volume control & shutoff valves, volume control, inlet strainer checkstops and 1/2 in. 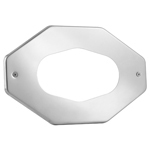 NPT inlets and outlets. 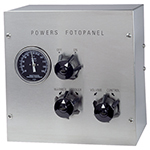 Powers Series 440 Fotopanel with union strainer checkstops consist of a thermostatic mixing valve, separate volume control & shutoff valves, dial thermometer with recalibration screws, vacuum breaker mounted in outlet, all enclosed in a stainless steel panel and cabinet for wall or deck mounting and 1/2 in. inlets and outlet. The PressureGuardTM installs in the supply waterlines to individual mixing fixtures to eliminate troublesome and unsafe pressure fluctuations between hot and cold water lines. 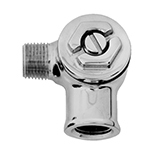 For control of inlet pressures to 2-handle valves or mechanical mixing valves. 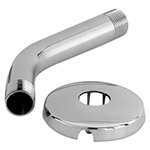 This unit can be used in front of two hand valve sets or mechanical single lever mixing faucets. 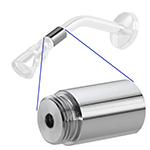 Consists of replaceable cartridge with anti-lime pressure equalizing chamber. 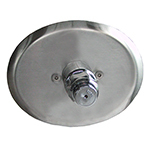 Provide access for concealed installations. 1/2 in. NPT pipe connections. The PressureGuardTM is not a mixing valve, but acts on both supply water lines to equalize the pressures and eliminate the discomfort that results when someone uses a flush-valve, dishwasher or other fixtures. 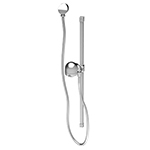 Designed to provide thermostatic protection for the shower. If the temperature during the shower reaches 115°F (46°C) this device instantly reduces the flow to less than 0.25 gpm (from 2.5 gpm). Once the temperature drops below 115°F (46°C) the HT115 automatically resets and resumes the full flow within seconds. 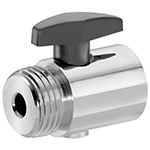 It is ideal for use with two handle, single handle, pressure balance and temperature control valves. It is easy to install and can be used for new or existing application.